Asahi Group Holdings, Colgate Palmolive, Ford Motor Company and Toyota Motor Corporation are among the global corporations achieving an A rating for their efforts to improve water security. This is according to the first global ranking of corporate water stewardship revealed today by global non-profit group CDP, which holds the most comprehensive dataset of publicly available corporate water information collected on behalf of investors. 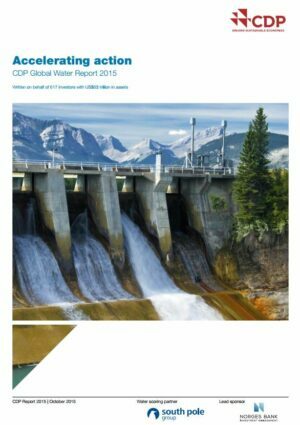 In a year when the World Economic Forum has ranked global water crises – including drought, increased risk of flooding and deteriorating water quality – as the greatest threat facing the planet over the next decade in terms of impact1, CDP’s new global water report, ‘Accelerating action’, shows that some companies are beginning to move ahead of the pack in addressing water concerns. Eight businesses from four sectors have joined the CDP Water A List for their approach to water management. The Water A List highlights those companies that are on the path to sustainably managing water resources. They are taking action to mitigate corporate water risk and realizing opportunities in ways that not only reduce their own impacts but critically, improve water security for the environment and other water users. There is growing interest among institutional investors in water-related risk, opportunity and disclosure, with over four times the number of investors backing the CDP request this year compared with the program’s first year in 2010. This year 617 institutional investors asked 1,073 of the world’s largest publicly listed companies across industry sectors with high water vulnerability or impacts to disclose how they are adapting and responding to worsening water security. CDP’s new global water report analyzes the 405 company responses to this request – over twice the number of companies analyzed in 2014. While there are signs of progress in corporate water action from this group of leading companies, there is a gap with the rest of the market that is of increasing concern to investors. Despite ongoing water crises such as droughts in California and parts of Brazil, more than half (53%) of companies are failing to conduct a comprehensive risk assessment – a basic first step for any company seeking to ensure business resilience against water issues. Oil and gas companies in particular are not meeting investor demands for transparency and action. Just under a quarter (22%) of the world’s largest publicly listed energy companies responded to CDP’s annual request from investors to account for their water management strategies in 2015, less than the average disclosure rate of 38% this year. This lack of transparency is concerning given over two-thirds of oil and gas companies (65%) disclosing to investors via CDP say their business is vulnerable to substantive water risks. Furthermore, the bottom line has already been hit for almost half (43%) of these companies due to water-related challenges in the past year – among the highest of the eight sectors featured in CDP’s report and much higher than the cross-sector average of 27%. Hey Buddy!, I found this information for you: "World’s best performing companies on water security revealed". Here is the website link: https://www.duurzaam-ondernemen.nl/worlds-best-performing-companies-on-water-security-revealed/. Thank you.